Great apparel display when you are on the move! The innovative design of the Portable Double Rail Garment Display rack allows for quick set up and take down. Easily folds up for storage and is light enough to carry. 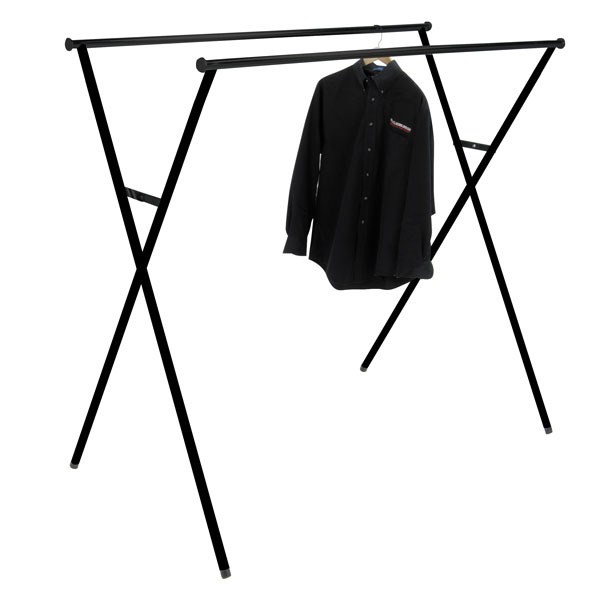 This quick set-up retail clothing rack is an ideal display for trades hows, craft shows, sidewalk sales and flea markets when you are on the move. This retail clothing rack features no-slip legs to keep it in place. Great as a quick and easy coat rack! Check out our YouTube video to view the easy assembly! For additional offerings, we invite you to take the time to check out our complete collection of retail clothing racks for sale at Specialty Store Services now. 60 in. W x 33 in. D x 53 in. H.